Diabetes is a lifelong condition that causes a person’s blood sugar level to become too high. It is also known as diabetes mellitus. Type 1 diabetes is often referred to as insulin-dependent diabetes. It is also sometimes known as juvenile diabetes or early-onset diabetes because it often develops before the age of 40, usually during the teenage years. In type 1 diabetes, the pancreas (a small gland behind the stomach) does not produce any insulin. Insulin is a hormone that regulates blood glucose levels. If the amount of glucose in the blood is too high, it can seriously damage the body’s organs. If you have type 1 diabetes, you will need to take insulin injections for life. You must also make sure that your blood glucose levels stay balanced by eating a healthy diet, taking regular exercise and having regular blood tests. In type 2 diabetes, the body does not produce enough insulin, or the body’s cells do not react to it. This is known as insulin resistance. This topic focuses on type 1 diabetes. Without insulin, the body breaks down its own fat and muscle (leading to weight loss). In type 1 diabetes this can lead to a serious short- term condition where the bloodstream becomes acidic along with dangerous dehydration (diabetic ketoacidosis). Type 1 diabetes is an autoimmune condition, where your immune system (the body’s natural defence against infection and illness) mistakes the cells in your pancreas as harmful and attacks them. It is important that diabetes is diagnosed as early as possible so that treatment can be started. Diabetes cannot be cured, but treatment aims to keep your blood glucose levels as normal as possible, and control your symptoms to prevent health problems developing later. If you are diagnosed with diabetes, you will be referred to Dr. B C Shah for specialist treatment. He will be able to explain your condition to you in detail and help you understand your treatment. They will also closely monitor your condition. As your body cannot produce any insulin, you will need to have regular insulin treatment to keep your glucose levels normal. You will need to learn how to match the insulin you inject to the food you eat, taking into account your blood glucose level and how much exercise you do. This skill needs to be practised and learnt gradually. Insulin comes in several different forms, each of which works slightly differently. For example, some last up to a whole day (long-acting), some last up to eight hours (short-acting) and some work quickly but do not last very long (rapid-acting). Your treatment may include a combination of these different insulin preparations. Left untreated, diabetes can cause many different health problems. Large amounts of glucose can damage blood vessels, nerves and organs. Even a mildly raised glucose level that does not cause any symptoms can have damaging effects in the long term. If you have type 1 diabetes, you will need to look after your health very carefully. Caring for your health will also make treating your diabetes easier and minimise your risk of developing complications. Eating a healthy, balanced diet and exercising regularly will lower your blood glucose level. And stopping smoking (if you smoke) will reduce your risk of developing a cardiovascular disease. During pregnancy, some women have such high levels of glucose in their blood that their body cannot produce enough insulin to absorb it all. This is known as gestational diabetes, and it affects approximately 5% of pregnant women. For people with existing type 1 diabetes, pregnancy can also make this worse. Gestational diabetes can increase the risk of health problems in an unborn baby, so it is important to keep the levels of glucose in your blood under control. In most cases, gestational diabetes develops in the second half of pregnancy and disappears after the baby is born. Read more information about diabetes in pregnancy and gestational diabetes. If you have diabetes, your blood glucose levels can become very low. This is known as hypoglycaemia (or a “hypo”), and happens because any insulin in your body has moved too much glucose out of your bloodstream. If a hypo is not brought under control it can lead to confusion, slurred speech and unconsciousness. If this occurs, you will need to have an emergency injection of a hormone called glucagon. This hormone increases the glucose in your blood. As diabetes occurs as a result of your body being unable to produce any, or enough, insulin to regulate your blood glucose, your blood glucose levels may become very high. This happens because there is no insulin to move glucose out of your bloodstream and into your cells to produce energy. Left untreated, hyperglycaemia can lead to diabetic ketoacidosis, which is a serious condition where the body breaks down fat and muscle as an alternative source of energy. This leads to a build-up of acids in your blood, which can cause vomiting, dehydration, unconsciousness and even death. Type 1 diabetes occurs when the body is unable to produce insulin. Insulin is a hormone that is needed to control the amount of glucose (sugar) in your blood. When you eat, your digestive system breaks down food and passes its nutrients into your bloodstream. The pancreas (a small gland behind your stomach) usually produces insulin, which transfers any glucose out of your blood and into your cells, where it is converted to energy. However, if you have type 1 diabetes, your pancreas is unable to produce any insulin (see below). This means that glucose cannot be moved out of your bloodstream and into your cells. Type 1 diabetes is an autoimmune condition. Your immune system (the body’s natural defence against infection and illness) mistakes the cells in your pancreas as harmful and attacks them, destroying them completely or damaging them enough to stop them producing insulin. It is not known exactly what triggers the immune system to do this, but some researchers have suggested that it may be due to a viral infection. Type 1 diabetes is usually inherited (runs in families), so the autoimmune reaction may also be genetic. If you have a close relative, such as a parent, brother or sister with type 1 diabetes, you have about a 6% chance of also developing the condition. The risk for people who do not have a close relative with type 1 diabetes is just under 0.5%. It is important to diagnose diabetes as early as possible so that treatment can be started. If you experience the symptoms of diabetes, you should visit Dr. B C Shah as soon as possible. They will ask you about your symptoms and may request a urine and blood test. Your urine sample will be tested to see whether it contains glucose. Urine does not usually contain glucose, but if you have diabetes, some glucose can overflow through the kidneys and into the urine. Your urine may also be tested for ketones (chemicals) which indicate type 1 diabetes. If your urine contains glucose, a blood test can be used to confirm the diagnosis of diabetes. A sample of your blood will be taken in the morning, before you have had anything to eat, and it will be tested to measure your blood glucose levels. If your blood glucose levels are not high enough for Dr. B C Shah to diagnose diabetes, you may need to have an oral glucose tolerance test (OGTT). This is also sometimes referred to as a glucose tolerance test (GTT). After drinking a glucose drink, samples of your blood will be taken every half an hour, for two hours. The samples will be tested to find out how your body is dealing with the glucose. If you have been diagnosed with diabetes, you will be referred for specialist treatment from Dr. B C Shah. They will be able to explain your condition in detail and help you to understand your treatment. They will closely monitor your condition to identify any health problems that may occur. The aim of treating diabetes is to help people with the condition control their blood glucose levels and minimise the risk of developing future complications. Access to information and appropriate support for people with type 1 diabetes, including access to a structured education programme. If diabetes is not treated, it can lead to a numberof different health problems. High glucose levels can damage blood vessels, nerves and organs. Prolonged, poorly controlled blood glucose levels increase the likelihood of developing atherosclerosis (furring and narrowing of your blood vessels). This may result in a poor blood supply to your heart, causing angina (a dull, heavy or tight pain in the chest). It also increases the chance that a blood vessel in your heart or brain will become completely blocked, leading to a heart attack or stroke. High blood glucose levels can damage the tiny blood vessels of your nerves. This can cause a tingling or burning pain that spreads from your fingers and toes up through your limbs. If the nerves in your digestive system are affected, you may experience nausea, vomiting, diarrhoea or constipation. Retinopathy is where the retina (the light-sensitive layer of tissue) at the back of the eye is damaged. Blood vessels in the retina can become blocked or leaky, or can grow haphazardly. This prevents the light from fully passing through to your retina. If it is not treated, it can damage your vision. The better you control your blood sugar levels, the lower your risk of developing serious eye problems. Having an annual eye check with a specialist (an ophthalmologist or an optometrist) can help pick up signs of a potentially serious eye problem early so that it can be treated. Diabetic retinopathy can be managed using laser treatment if it is caught early enough. However, this will only preserve the sight you have but will not make it better. If the small blood vessels of your kidney become blocked and leaky, your kidneys will work less efficiently. In rare, severe cases, this can lead to kidney failure and the need for dialysis (treatment to replicate the functions of the kidneys). In some cases, a kidney transplant may be necessary. Damage to the nerves of the foot can mean that small nicks and cuts are not noticed, which can lead to the development of a foot ulcer. About 1 in 10 people with diabetes get a foot ulcer, which can cause serious infection. If you develop nerve damage, you should check your feet every day and report any changes to your doctor, nurse or podiatrist. Look out for sores and cuts that do not heal, puffiness or swelling and skin that feels hot to the touch. You should also have a foot examination at least once a year. In men with diabetes, particularly those who smoke, nerve and blood vessel damage can lead to erection problems. This can usually be treated with medication. Pregnant women with diabetes have an increased risk of miscarriage and stillbirth. If your blood sugar level is not carefully controlled during early pregnancy, there is also an increased risk of the baby developing a serious birth defect. Pregnant women with diabetes will usually have their antenatal check-ups in hospital or a diabetic clinic. This allows doctors to keep a close eye on their blood sugar levels and control their insulin dosage more easily. If you have type 1 diabetes, you will need to look after your health very carefully. Caring for your health will make treating your diabetes easier and minimise your risk of developing complications. 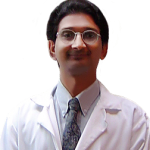 Because type 1 diabetes is a long-term condition, you will be in regular contact with Dr. B C Shah. Developing a good relationship with Dr. B C Shah and team will enable you to freely discuss your symptoms or any concerns that you have. The more they know, the more they can help you.Dr. B C Shah will also need to check your eyes, feet and nerves regularly because they can also be affected by diabetes. It is not true that if you have diabetes you will need to eat special diet. Eat a healthy diet that is high in fibre, fruit and vegetables and low in fat, salt and sugar. Read more about healthy eating. Like anyone else, you should aim to do at least 150 minutes (2 hours and 30 minutes) of moderate-intensity aerobic activity, such as cycling or fast walking, every week. However, before starting a new activity, speak to Dr. B C Shah. Drinking alcohol may also affect your ability to carry out insulin treatment or blood glucose monitoring, so always be careful not to drink too much. The recommended daily alcohol limit is three-to-four units for men and two-to-three units for women. People with a long-term condition, such as type 1 diabetes, are encouraged to get a flu jab each autumn to protect against flu (influenza). An anti-pneumoccocal vaccination, which protects against a serious chest infection called pneumococcal pneumonia, is also recommended.